It's National Fire Prevention Week. That means there's no better time than now to share with you about the Disney Planes: Fire and Rescue (2014) Blu-ray, DVD and Digital HD release scheduled for November 4th. Mommy Blog Expert mom blogger Norma Perez covered a special event this summer at flagship The Disney Store in Glendale, California to celebrate this charming picture which graced the big screen just a few short months ago. 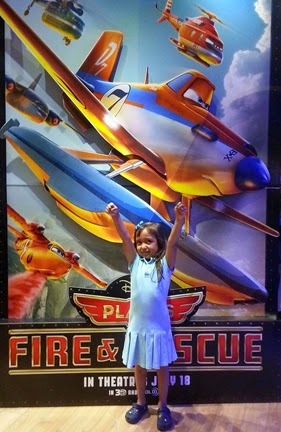 It was a dream play date come true for Norma's young daughter, Sarah, who got to play with an assortment of new movie theme toys, participate in an engaging in-store activity and see a demo of a brand new app based on the animated film. The lucky kids and their families who got to attend the celebration also were treated to educational activities on camp fire safety, presented by the U.S. Forest Service. The festivities kicked off The Disney Store Summer Play Days free event for the public which took place in the brand's stores across the U.S. on July 19th. In Disney Planes: Fire and Rescue, kids comedy sequel to the original movie Planes (2013), the familiar crew returns with another entertaining adventure and a new supporting cast of friends. What happens when Dusty Crophopper discovers his plane is damaged and he may be grounded for good? He becomes a member of an elite forest fire and rescue unit to train as a hotshot aerial firefighter. Joining Dusty in the quest to save the day at Piston Peak National Park to put out fires are a bevy of loveable characters. These include Blade Ranger, Lil' Dipper, Windlifter, Maru, Cad, Mayday (played by the iconic actor Hal Holbrook) and Nick Loop'n' Lopez, voiced by Erik Estrada who many will remember from his role on the hit 70s TV show CHiPs -- as well as quite a few other interesting players. In addition to lots of fun free online games and downloadable kids activities and crafts that are just a click away, learn more about Planes: Fire and Rescue on the Disney movie's official site. With a runtime of approximately 83 minutes, the PG-rated movie will be released on Blu-ray + DVD and + Digital HD ($39.99); DVD ($29.99); and Digital HD on November 4th. It is available now for pre-order here. There is also a fun free Planes: Fire and Rescue by Disney app as well as a more indepth version of the app for iPhone and iPad offered for $4.99 in the iTunes Store. FTC Disclosure: Norma Perez and family, representing Mommy Blog Expert, attended The Disney Store movie promo event mentioned and received a gift bag to facilitate this kids movie review post. No other compensation or payment is associated with this post. See complete FTC Disclosure information that appears at the bottom of MommyBlogExpert's main page and at the bottom of every individual post on this blog, including this one.